While the Guard and the cavalry received much of the attention, it was as always the ordinary infantry that was the backbone of Napoleon’s armies, doing most of the fighting and dying. They were the essential element in all of his victories, making the French Army the most powerful in Europe in his hands. However years of attrition warfare trying to subdue Spain, and the disastrous 1812 campaign in Russia, meant that France had too few of her experienced infantry when the Allies resumed the struggle in 1813 and 1814, leading to Napoleon’s downfall and the restoration of the Bourbon monarchy. As can be seen from our pictures, all the men in this set are wearing greatcoats apart from the senior officer at the end. Greatcoats were not officially issued until 1805, so before that date soldiers either provided their own or went without. Even after the official issue, designs varied, but those here are all double-breasted and look fine, though several have lost buttons. Shakos were issued from 1806, and most here wear one. In most cases these have a cover, which hides unit designation and precise shape, although a couple are uncovered and seem to show both badge and cords, the latter being forbidden in 1810 but still appearing after that date. Three do not wear shakos, but instead the forage cap known as the pokalem, a pie-shaped cap with flaps that could be lowered to protect the neck, as one of those here is showing. This type of cap was issued from 1812 onwards, so is the most precise dating element on these figures. Some of the figures wear gaiters, some trousers, and others are unclear, but like the rest of the uniform they are accurate. Every private here has a knapsack and a cartridge pouch, which look reasonable although here too there is variation in design as there probably was in reality. None of the knapsacks have the long strap running vertically round the middle of the knapsack, although this may be due to the coat not being stowed on top. We were particularly pleased to see a couple of these men with a pan or dish strapped to the knapsack, which was common but is rarely modelled. Another item often forgotten on models is the water container. Again this was not formal issue, so the men used ones of various types, some of which can be seen here, although some lack one entirely. Some of the men have a sabre and bayonet held in a combined frog suspended from a cross-belt over the right shoulder. 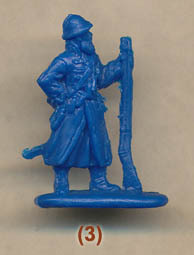 These are likely to be grenadiers or light infantry – otherwise hard to tell apart when wearing the greatcoat. For the fusiliers, they made do with a bayonet attached to the cross-belt over their left shoulder, although in this set some have no visible bayonet scabbard at all. Some of the pouches have no badge, and some do, which you would associate with the grenadiers and lights, but here there seems no correlation and pouch decoration is present or absent randomly. We felt the title of this set was poorly chosen, because none of these men are in the proper ‘at attention’ posture. This is because most have their feet firmly together whereas the correct position called for the feet to be apart at the toes, making a roughly 90 degree angle. The poses above the feet caused some head-scratching too, because it is difficult to understand what Strelets are trying to achieve here. The first four poses pictured are in no sort of recognised drill pose at all. Had they been on parade then at least the musket would have been in the right hand when resting on the ground like this, but as two of these men do not even have their feet together they are really just standing at ease rather than at attention. The first four in our second row all have the musket sloped on the left shoulder. ‘Slope Arms’ was a position used when on the march, so presumably these men are just about to set off. Only the last figure in the top row is properly at attention, at Shoulder Arms, while the other two in that row seem to be cuddling their muskets in strange ways that are no part of the drill – the second may be part-way through some change of position as both hands are on the musket. The last figure in the second row looks to be on guard duty (or perhaps Arms Inspection), but again he should be holding his musket in his right hand. So some puzzling poses, and we would have liked to have seen more of the poses promised on the box artwork, which shows half the men at Shoulder Arms and the rest at Present Arms (a tough pose to make, we know). The selection of single-copy poses in our last full row offers more of the useful extras most people need but in small numbers. First is a fifer, with his case on a belt by his side, and a nice pose. Next is a drummer, a necessary part of any unit and here actually beating his drum. The pose is extremely awkward as the drum is hitched very high and perfectly horizontal, meaning the left hand can barely bend enough to allow the stick to reach the instrument. As a result it is a poor figure, made all the worse by the very poor drum, which lacks all the basic details all such drums had, but sports a zigzag pattern on the side which has no basis in fact. The eagle-bearer is much better, with an uncased but limp flag that looks rather small but is likely to be correct for the period. The fourth man is a saluting officer who has an interesting cord round his shako that perhaps marks him out as for the light infantry. Finally we have a senior officer, perhaps even a marshal, who also salutes. The sculpting of these figures is quite good, with good proportions and slender weapons and kit. The finer detail is lacking, so the badges on the shako are not discernible, and of course as most of the weapons are facing the mould there is a limit to the detail here, although it is pretty good all the same. We have already talked about the bad drum, which is the worst thing here, and there is a little bit of flash in places, some of which does disfigure a few of the faces that are side-on to the mould, but the general standard is good if a little rough compared to the best sets on this subject from elsewhere. The fairly motley appearance of these men, and particularly the missing kit and the wearing of caps, put us in mind of the ‘Marie-Louise’ conscripts of 1813 and 1814, when France struggled to equip her new replacement soldiers. However we found the mix of details on these figures pleasing and quite believable, and there are no accuracy issues apart from the drum. Sculpting is quite acceptable too, and the special poses are mostly good, but the choice of the main poses confused us and is not a strong point of this set, particularly as customers might be expecting to buy several boxes and obtain enough figures to place together in a nice uniform parade. These figures are not suitable for that, so we are not sure what they are intended for, although if these are the poses you are looking for then this set will meet your needs quite well.